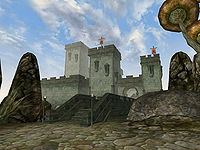 Situated just south of Sadrith Mora, Wolverine Hall is an attempt on the part of the Imperials to project power in a region of Vvardenfell where they are relatively powerless. The Telvanni tolerate the presence of the fort mostly because nobody cares enough to knock it down. Wolverine Hall houses the services not permitted in the town itself, such as the Mages Guild, Fighters Guild and Imperial Cult shrine. These are concealed within the fort itself. Between the Hall and the town itself is Dirty Muriel's Cornerclub, a Nord-style building that is home to the local Thieves Guild. To reach the services, exit the door on the left as you enter the shrine from outside. Follow the spiral stairway up to the mages or down to the fighters. It is easy to get lost in the fort. Dirty Muriel's Cornerclub is a social gathering place for people of the shadier kind, just outside of the fort. Big Helende is the boss of the local Thieves Guild. Erer Darothril is the master trainer of Illusion in the Cornerclub. Skink-in-Tree's-Shade is the Mage Steward and master trainer in Speechcraft, but only serves high-ranking Guild members. Hrundi is the Champion and quest giver in the Fighters Guild downstairs. 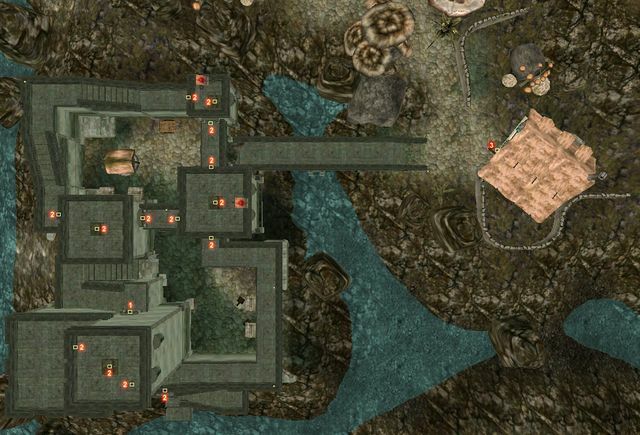 The easiest access to the rest of Morrowind is through the Guild Guide in the Mages Guild. 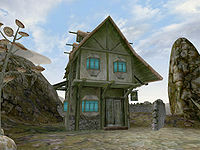 Unless you are a Telvanni retainer or kin, you're not supposed to sleep anywhere in Sadrith Mora except the Gateway, the official Telvanni hostel for outsider visitors. The Fighters Guild has beds for its members. Omaren Ancestral Tomb is located east of Wolverine Hall, on a small island. It connects to the Forgotten Vaults of Anudnabia, with a Daedric Face of Terror and the Skull Crusher.